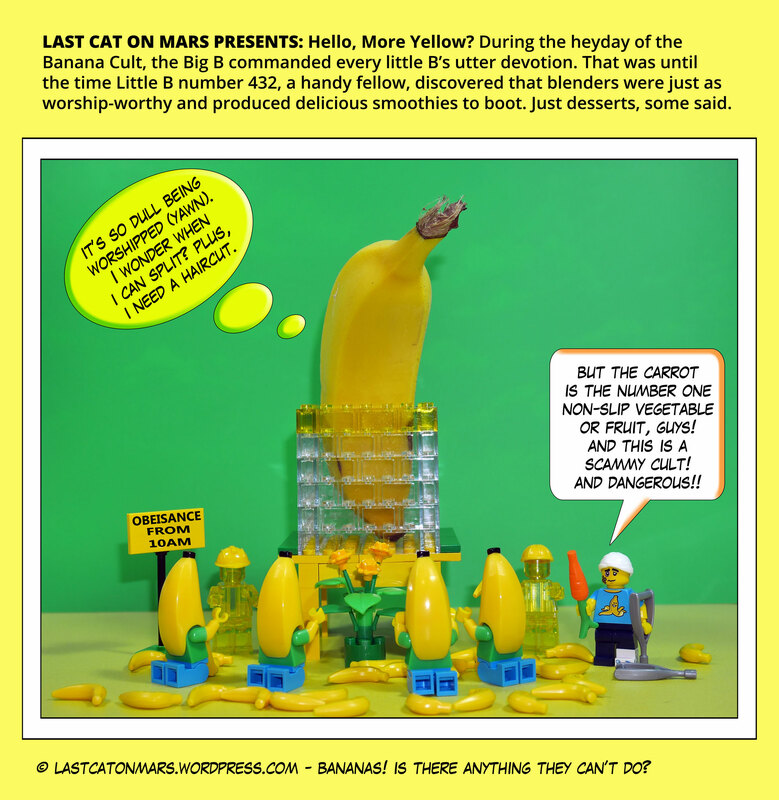 Last Cat On Mars Presents: Hello, More Yellow? You may have noticed that I have a certain affection for the appealing peelable fruit. That’s because it’s so appealing and peelable, of course. It goes without saying, doesn’t it, so why say it? Why not? Why do we feel as though we are progressing in circles, or at least bendy bits. It’s the banana cult and its wily ways. Enjoy a mellow yellow banana now – you know you want to, of course you do. 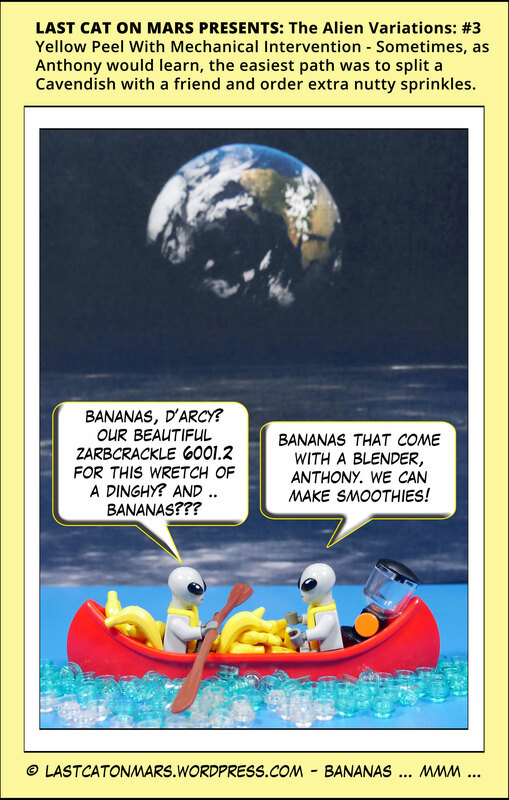 This entry was posted in Variety Show and tagged bananas, cartoon, comic, cult, lego, minifigures on February 22, 2017 by Jay Verney. Hey there fans of Le Tour, which has just this very last few days, hours, minutes, or whenever, begun. I only watch it for the recipes, as you well know, but seeing as how I originally hail from sunny, banana-y Queensland before the Martian residentiality (where I don’t have to vote, hahahahaha) I thought we’d start it off in style, with technology on parade, and in heaps. And while the opportunity presents, may I offer my sincere (not really – tee hee) condolences to those of you in Ozland who await the outcome of our latest democratic shenanigans – criticise it if you must, but remember Churchill, who said something like: Democracy is the worst possible system of government – except for all the others. Stay faithful, comrades and remember, vote early, vote often. 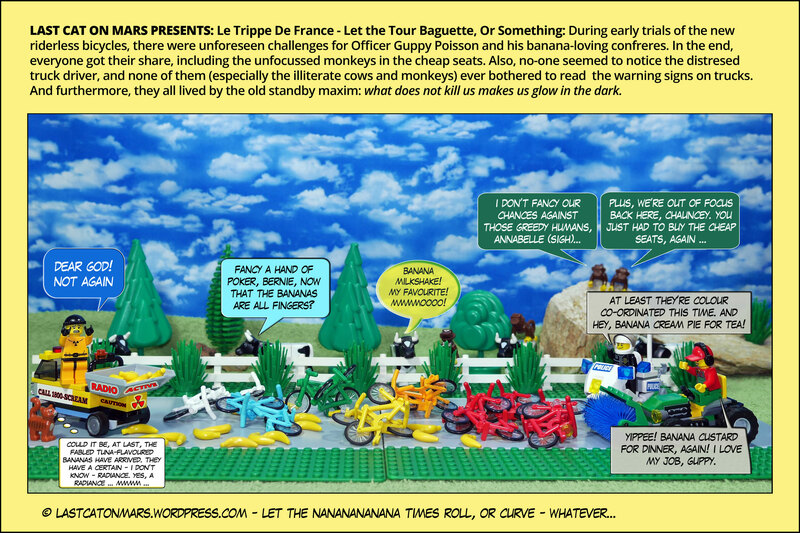 This entry was posted in Variety Show and tagged bananas, bicycles, cartoon, comic, cows, Dr on Mars, Last Cat, Le Tour De France, Le Trippe de France, minifigures, monkeys on July 4, 2016 by Jay Verney. The thing about the banana is that it’s the perfect fruit. It can go anywhere at a second’s notice. It’s a lovely colour whether ripe or unripe. It can be ready for breakfast, lunch, or dinner, or any snack in between. While felines may not be totally enamoured of the curvy yellow handful of peelworthy goodness (though many are), they appreciate nature’s creativity, and understand that literary types, both humanoid and monkeyoid, are constantly inspired by its presence. Especially with oats and honey, and whipped cream and jelly, and oh, rice cakes, toast, vegemite, jam, curd, Mrs On Mars undoubtedly delicious banana cream pie, etcetera. And the odd tuna bake. Very odd. Enjoy a banana today, and write your master work. 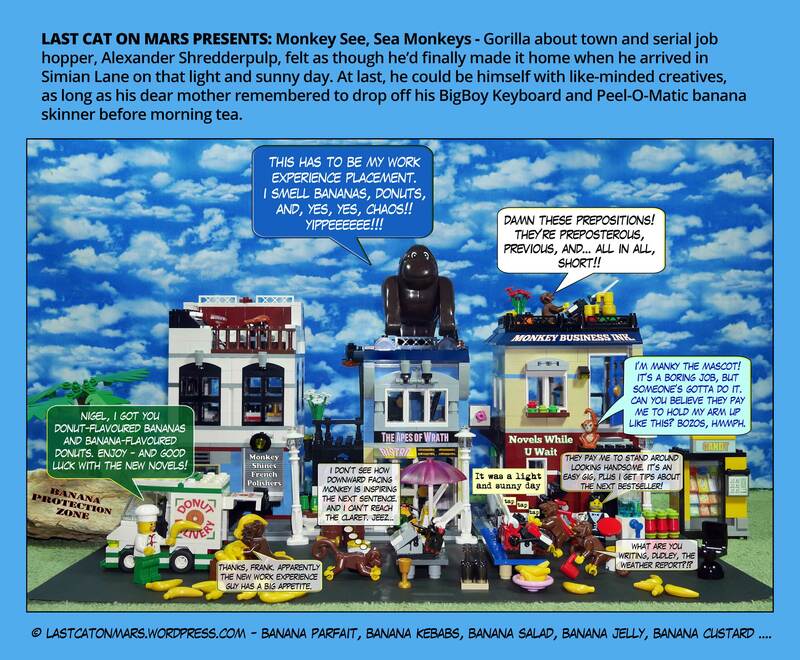 This entry was posted in Literary and Literal, Variety Show and tagged bananas, cartoon, comic, donuts, gorilla, lego, minifigures, monkeys, typewriters, writing on June 20, 2016 by Jay Verney.